The photos below show the strongest areas of doubling on the date and LIBERTY on this Franklin Half dollar. Listed for James Moloney in September of 1999 as VCR#1/DDO#1. 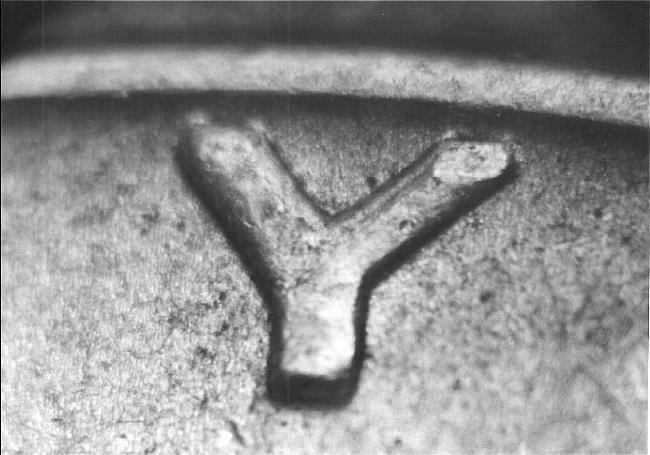 Hub doubling, or what collectors commonly refer to as a doubled die, is possible due to a phenomenon known as work hardening. This causes the metal of the face of a die to become too hard and too brittle to allow a complete image to be sunk into the die in one operation without causing it to crack or shatter (during the multiple hubbing process). As a result, several impressions or hubbings are required to produce a die when using this process. (The multiple hubbing process was largly replaced by the U.S. Mint starting in 1997 and 1998 by the more modern "single squeeze" restrained hubbing process.) Between each hubbing the die is removed from the press and annealed (softened) thus allowing for another impression without shattering the die. If for some reason a partially finished die is reinstalled into a press for strengthening and the hub and die are improperly indexed, resulting in a misalignment of images, or if the hub varies in design from the one(s) used for earlier impressions -- hub doubling will result.